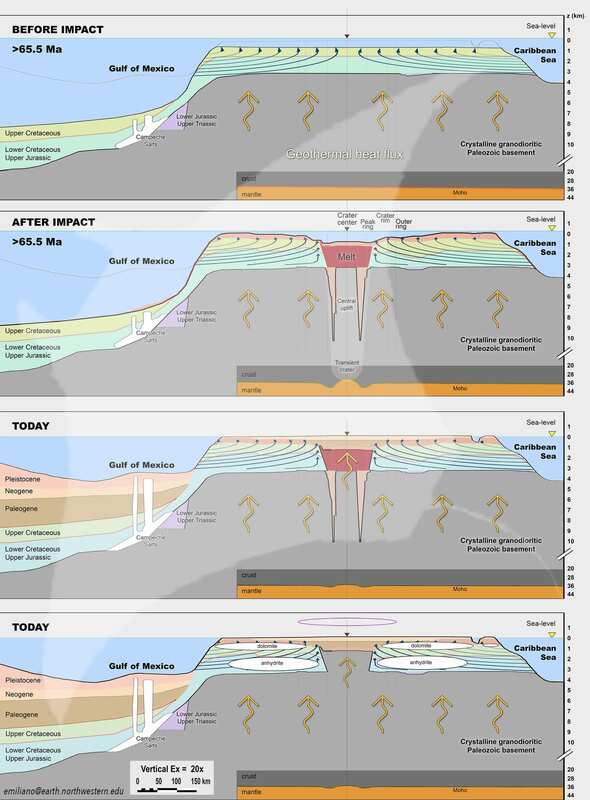 Hydrogeothermal Convective Circulation Model for the Formation of the Chicxulub Ring of Cenotes in the Yucatán Peninsula, Mexico. Subterranean Estuaries in Karst: Water-Rock interactions and elemental flux to coastal ocean. On the Tectonic Stability of the Yucatan Block. Despite being deeply buried, the topography and geophysical characteristics of the multi-ring Chicxulub impact structure are reflected on the now subaerial Yucatan Peninsula with aligned arcs of cenotes (sinkholes), forming the “Ring of Cenotes”. A pending question is the determination of the geological, geochemical, structural features and associated processes that have led to void development, and the upwards propagation of the voids, cross cutting over 1,000 m of super-deposited carbonate sequences. Drawing from the published literature on drill core and geophysical surveys undertaken by Pemex, UNAM, and IODP/ICDP, numerical modeling, and general carbonate platform hydrothermal reactive transport models, we provide a conceptual model for the genesis of the Ring of Cenotes. In horizontally bedded carbonate platforms, geothermal gradients will drive convective flow, with strong vertical components specifically in the platform center. In the Yucatan Platform, a high occurrence of anhydrite and dolomite at depth evokes early burial dolomitization and coupled anhydritization, sourcing Mg+ from seawater. The cenotes overlying the crater are deep (150+ m) vertical shafts with most (but not all) breaching the surface. The pit geomorphology suggests a hypogene (bottom-up) formation. Also, water temperature and conductivity profiles support ongoing vertical flux in some deep pit-cenotes. This work was presented for the first time at the annual conference of the American Geophysical Union (AGU) in San Francisco, 2015. An extended and rigorous version is already under review for its probable publication in a prestigious peer-reviewed journal. Submarine groundwater discharge (SGD) is now recognized to be globally significant, with a flux of fresh and re-circulated marine water reaching 80-160% of the river discharge. Carbonate coastlines are of particular interest, with some karst coastal springs in the Bahamas and the Yucatan each discharging 108-1010 m3/year, in addition to distributed diffuse discharge. The adsorption and desorption of phosphate within carbonate substrate is a chemical equilibrium between dissolved orthophosphate (PO43-) and iron hydroxide or calcium carbonate bound phosphate, mediated by pH and oxygen availability. 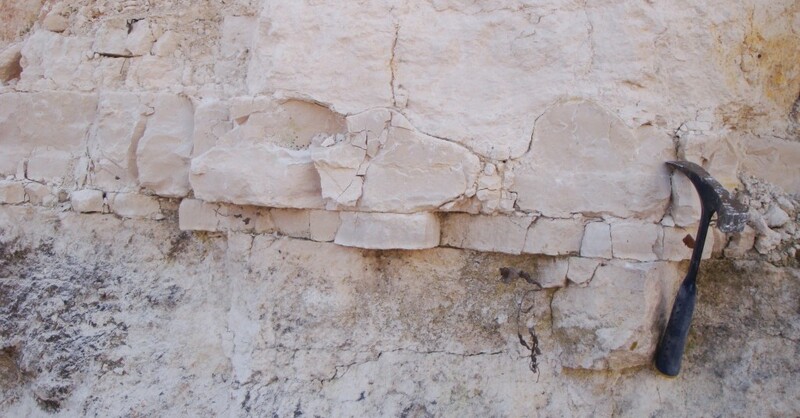 Laboratory experiments using Key Largo limestone from the Everglades have shown that phosphate is adsorbed onto the carbonate sediment when bathed in fresh water, and desorbed and dissolved out of the carbonate matrix when flushed with marine water. Rising sea levels raise the elevation of the typically oxic fresh-water lens in density stratified coastal aquifers, while also flushing anoxic evolved marine-water through increasing volumes of carbonate rock. We hypothesize the potential for significant discharge of P and Fe from carbonate coastlines such as the Yucatan Peninsula, due to desorption of calcium carbonate bound phosphorus under shifting redox conditions, as well as the release of the iron oxide bound phosphorus by elevated dissolution rates along the fresh-saline density interface. Initial results of bulk rock composition from vertical sample profiles obtained while cave diving will be used to constrain the magnitude of potential P and Fe discharge. The release of geologically sequestered P and Fe from carbonate substrate may represent a previously unappreciated source of limiting nutrients along low latitude carbonate coastlines flanked by coral reef systems sensitive to eutrophication, and may prove valuable in understanding the growing list of eutrophic sites with no apparent anthropogenic nutrient source (e.g. Belize atolls). The Yucatán Block (YB) is a 450,000 km2 continental microplate, covering southeast Mexico, northern Guatemala, and Belize, and has been a structural entity since at least 230 Ma. The Yucatán Peninsula is the subaerial portion of a carbonate platform deposited over the YB unit, and it has been understood to be broadly tectonically stable. 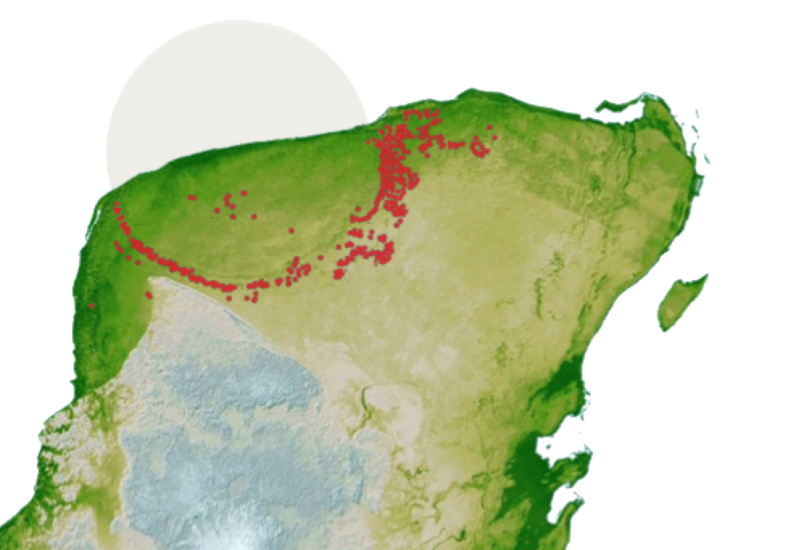 We use geodetic derived data products from the UNAVCO Data Archive Interface v2.0 (DAI v2) for GPS stations within the greater area, including PBO, COCONet, and TLALOCnet networks to explore the present day Yucatan Block motion and evaluate tectonic behavior. Visualizations were created employing two reference frame datasets, NAM08 assuming the interior eastern North America functions as a ‘stable’ rigid plate, and IGS08 representing the motions with respect to the Earth’s core. Present day NW motion of the YB is revealed, along with down-dip in the north-east corner. More than 10 years of data indicate average vertical rates on the order of 1 mm/year, which is of significance in interpretations of the hydrogeology, speleogenesis, paleoclimate records, and adaptation to climate change driven sea level rise. Coastal geomorphology, ecology, and archeological observations further indicate persistence of the measured vertical motions at least to the mid-Holocene. In the strict sense, the YB is tectonically stable without apparent deformation or rifting, however the rotation and tilt of the block merits further determination. Talk presented at the GSA Annual Meeting, Indianapolis, 2018. Presented at the AGU Virtual Poster Showcase, 2018. Hola Emiliano. Te felicito por este blog tan interesante. Hay alguna posibilidad de recibir alguna ´Newsletter`? Hola Efraín, gracias por tus palabras. Espero poder actualizar las secciones poco a poco y añadiré una sobre noticias actuales en el campo. Saludos. Muchas Felicidades por tu trabajo y gracias por compartir toda esta valiosa información. Gracias Michel, todo esto que hago va de la mano con la exploración y documentación que hace la comunidad de buzos de cuevas y grupos como el CEM. Un abrazo.